It’s giveaway time! In honor of National Coffee Day (one of our favorite holidays), we’re giving away two Mini Drip 5-Cups to two lucky fans! Starting Friday, September 25, visit Capresso’s Facebook page, and click on the “Giveaway” tab to submit an entry form. Two winners will be selected at random from fans that enter. Giveaway ends Monday, October 5. JURA Inc. is sponsoring this Contest of two (2) Mini Drip 5-Cup programmable coffee makers ($39.99 retail value). No purchase necessary to enter or win. In order to enter the Contest, you must agree to these Official Rules. The Rules consist of: (i) the terms and conditions on this page; and (ii) the Entry Form. If you do not agree to the Rules, you are not eligible to participate in the Contest or to win any of the prizes. You agree that registration for this Contest and/or a submission of an entry in the Contest constitutes your agreement to these Rules. The Contest is open to legal residents of 50 United States or District of Columbia and aged 18 or older at the time of entry. Employees and their family members of JURA Inc. are not eligible to win. Contest entry period begins September 25, 2015 at 9:30 a.m. CST and ends, October 5, 2015 at 9:30 a.m. CST. To enter, visit http://www.facebook.com/capresso. Click on the “Giveaway” tab and “like” Capresso, then follow the directions and submit a completed entry form. JURA Inc. accepts no responsibility for submissions delayed or lost, however caused. One entry per person. JURA Inc. will select two (2) winners at random and notify the winner via email within 48 hours of contest end. The notification email will be sent to the email address listed on the entry form. If the winner does not reply within twenty-four (24) hours of notice, he/she forfeits the prize and JURA Inc. reserves the right to select a new winner. JURA Inc. is responsible for shipping one (1) Capresso Mini Drip 5-Cup to each winner. Prize will be shipped ground. No Facebook, Twitter or Pinterest endorsement. This promotion is in no way sponsored, endorsed or administered by, or associated with, Facebook, Twitter, Instagram or Pinterest. You are providing your information to JURA Inc. and not to Facebook, Twitter, Instagram or Pinterest. The information you provide will only be used for winner notification purposes. It’s giveaway time! 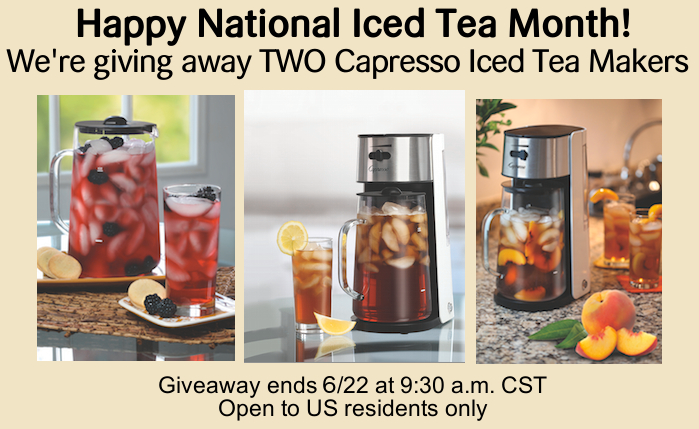 In honor of National Iced Tea month, we’re celebrating this summertime staple by giving away our Iced Tea Maker to two lucky fans! Starting Friday, June 12, visit Capresso’s Facebook page, and click on the “Giveaway” tab to submit an entry form. Two winners will be chosen at random from fans that enter. Giveaway ends Monday, June 22. JURA Inc. is sponsoring this Contest of two (2) Iced Tea Makers ($59.99 retail value). No purchase necessary to enter or win. In order to enter the Contest, you must agree to these Official Rules. The Rules consist of: (i) the terms and conditions on this page; and (ii) the Entry Form. If you do not agree to the Rules, you are not eligible to participate in the Contest or to win any of the prizes. You agree that registration for this Contest and/or a submission of an entry in the Contest constitutes your agreement to these Rules. The Contest is open to legal residents of 50 United States or District of Columbia and aged 18 or older at the time of entry. Employees and their family members of JURA Inc. are not eligible to win. Contest entry period begins June 12, 2015 at 9:30 a.m. CST and ends, June 22, 2015 at 9:30 a.m. CST. To enter, visit http://www.facebook.com/capresso. Click on the “Giveaway” tab and “like” Capresso, then follow the directions and submit a completed entry form. JURA Inc. accepts no responsibility for submissions delayed or lost, however caused. One entry per person. JURA Inc. will select two (2) winners at random and notify the winner via email within 48 hours of contest end. The notification email will be sent to the email address listed on the entry form. If the winner does not reply within twenty-four (24) hours of notice, he/she forfeits the prize and JURA Inc. reserves the right to select a new winner. JURA Inc. is responsible for shipping one (1) Capresso Iced Tea Maker to each winner. Prize will be shipped ground. No Facebook, Twitter, Instagram or Pinterest endorsement. This promotion is in no way sponsored, endorsed or administered by, or associated with, Facebook, Twitter, Instagram or Pinterest. You are providing your information to JURA Inc. and not to Facebook, Twitter, Instagram or Pinterest. The information you provide will only be used for winner notification purposes. Do you love espresso? Then you’ll love the Capresso “I Heart Espresso” Giveaway. 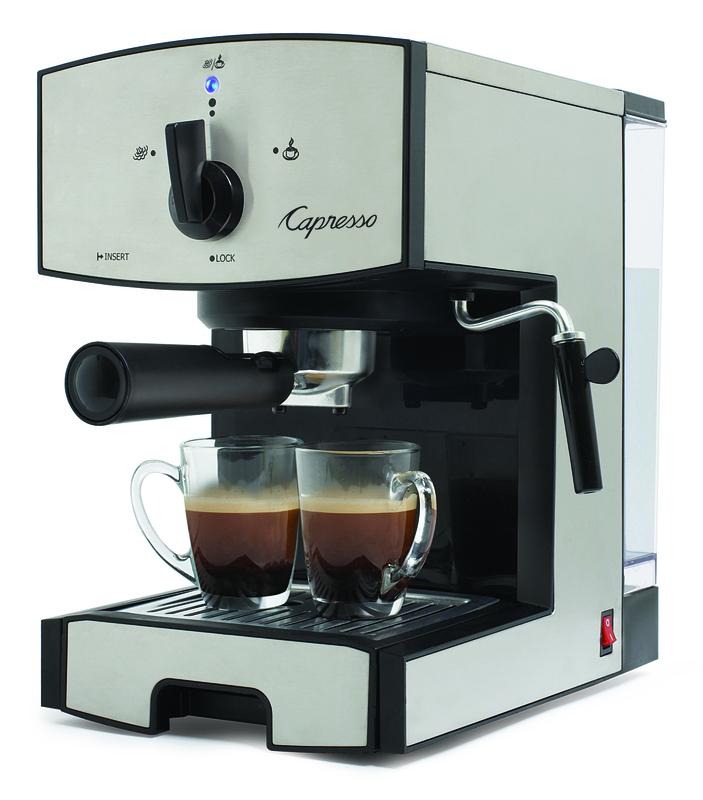 Enter and you could win a Capresso EC50 Pump Espresso & Cappuccino Machine. The Capresso EC50 makes delicious crema coffee, bold espresso and creamy cappuccinos. The compact machine features a stylish stainless steel exterior and small footprint. Don’t miss out on this great giveaway. Enter by July 17. 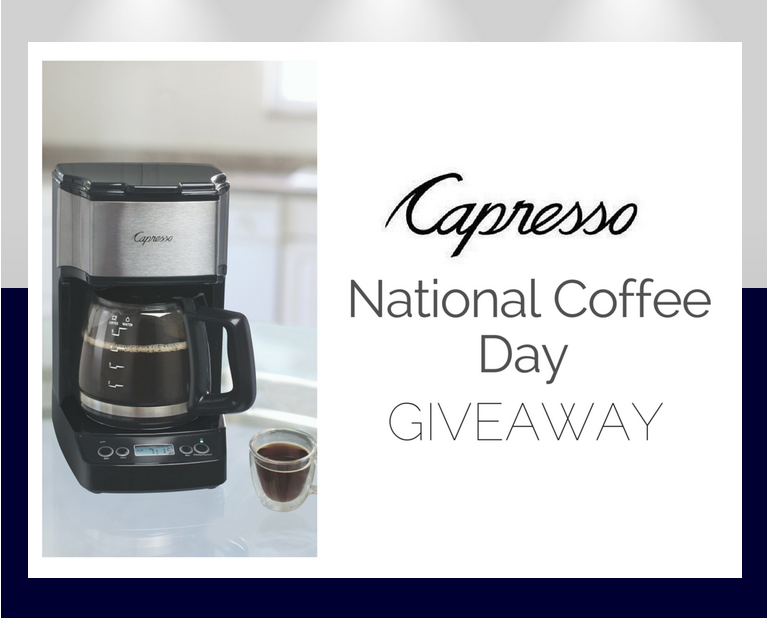 Visit the Giveaway tab on the Capresso Facebook page for more information.